A large diversity of different villas for sale in Palm Jumeirah is available on Just Property in well designed and curated property lists that are easier to check by property searchers. Palm Jumeirah is an iconic real estate landmark in Dubai. With a palm tree structure, the structure of the artificial island became popular around the world and became associated with the name Dubai. It’s a mixed use community that abounds with many luxury villa clusters and fancy hotels scattered around its trunk and fronds. It’s a real man wonder where that sets a new benchmark of luxury living around the region. The project homes many facilities and entertainment destinations very favorable by residents, it has a wide set of villas scattered around many gated communities that offer integrated living experience to the residents. The popular artificial archipelago sprawls over a total area of 5.4 square kilometers and was developed by Nakheel Properties, owned by Dubai government. It’s not the only palm island in Dubai, there are two other (Palm Jebel Ali and Palm Deira). Palm Jumeirah lies in a central location in Dubai in a close proximity to many popular entertainment destinations like Mall of the Emirates, Emirates Golf Club, Barasti Beach, Burj Al Arab Jumeirah Hotel, and many other. 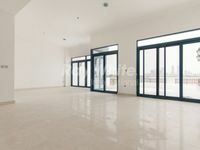 The available villas for sale in Palm Jumeirah offer splendid and unrivalled sea views, they feature exquisite interior designs and large spaces to fit the needs of large families, they also feature high standard amenities including private swimming pools, gardens, fitness gyms, and many other. There are several villa communities in Palm Jumeirah like Garden Homes, Signature Villas, Palma Residences, Canal Cove, Marina Residences and many other. These communities are fully integrated and equipped to grant residents total calmness and security. 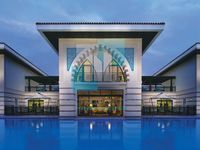 Palm Jumeirah villas for sale vary in size between two-bedroom, three-bedroom, and four-bedroom villas, there are even larger units to fit large families. The average sale price of Palm Jumeirah villas is AED 3,750,000. Villas offered range between furnished and unfurnished. Furnished villas comprise high end pieces of furniture and modern appliances, they are well suited for buyers looking for ready units to move. 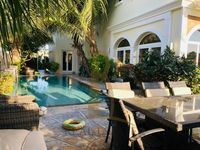 Unfurnished villas are more affordable, they also grant buyers the access to deck out their purchased villa according to their personal taste. No matter what kind of villa you are looking to buy, you’ll find a wide set of options in Palm Jumeirah. Investing in Palm Jumeirah villas could be very profitable since the community villas are highly demanded by Dubai residents. To keep the community of residents totally satisfied, the project includes a range of facilities including groceries, laundries, parks, restaurants, etc. Purchasing a property in Palm Jumeirah is opened to all nationalities since it’s a freehold area. In fact, owners of properties with value more than 1 million dirhams are eligible to obtain UAE residency. 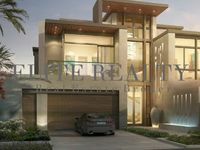 Just Property offers a wide selection of villas for sale in Palm Jumeirah, the displayed assortment includes units of different sizes and in many communities.